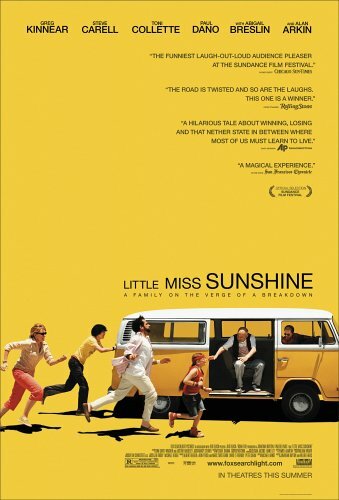 I’ve had Little Miss Sunshine at the top of my Netflix queue for weeks and I finally had a chance to watch it. I had pretty high expectations because it seemed like the type of movie I would enjoy. While I did enjoy it, I was also disappointed. I know the disappointment stems from the high expectations and not from it being a bad movie. It’s a good movie. The story is unique and the characters are even more unique. Though each of the other characters try to put themselves in the center of the story, Olive, the seven year old pageant hopeful is the center of not only the plot but the emotional center of the group of misfits. I was surprised at how easily I was able to accept Steve Carell as a suicidal, homosexual former professor. In some reviews I’d read, the reviewers couldn’t get past Michael Scott, Andy Stitzer, and Brick Tamland when watching him be sad. Alan Arkin was phenomenal and deserves his Oscar nomination, the scene in the hotel room with Olive is worth the win, especially if he did his own stunts under the sheet. I guess there were only two things that I felt were a let down and thus led me to be disappointed; I was let down by a real lack of development of Toni Collette’s character as a wife, sister, and mother and by the scene at the pageant. I’m purposely being vague, as I know many of you might not have seen it yet. I do recommend you see it, because it’s a rather beautiful story about how like I said before the youngest member of the family causes change in the rest of the characters. The music by DeVotchka is perfect and helps pace the action as well as set the tone. I’m glad to see Abigail Breslin was nominated for her performance as Olive because I’m sure there was a lot of her in that role.